“And do you come to me?” (From Matthew 3:13-17, Feast of the Baptism of our Lord, the First Sunday after the Epiphany) That’s the greeting Jesus receives from John. John almost seems surprised, taken aback, that Jesus has come to him. John has been in the wilderness preaching and baptizing. “Repent,” he says, “for the kingdom of heaven has come near.” The people of Jerusalem, Judea, and all the region around the Jordan went out to John. Pharisees and Sadducees, the ones John called a brood of vipers, went out to him. John continued, “One who is more powerful than I is coming after me; I am not worthy to carry his sandals.” That one, according to John, will purge and separate. He will gather the wheat and burn with unquenchable fire the chaff. John has some big expectations. That is more than John expected. “I need to be baptized by you,” John says to Jesus. It’s one thing for Jesus to show up but it’s another for him to show up wanting to be baptized. It’s one thing for Jesus to show up in power. It’s another for him to come just like all the others and to stand amidst the crowd and wait his turn to be baptized. So what about all that time preaching in the wilderness? Did John really understand what he was saying? I don’t think John had any idea just how near the kingdom would come to him. He had no idea that power would be found in humility, submission, and immersing one’s life in the life of another. He had no idea that he would be baptizing Jesus. He thought it would be, that it should be, just the other way around. I imagine each of us has known moments in life when it felt as if we had no choice but to muscle our way through. Power was the only way. The power to overcome, to defeat, to push aside. It was “do or die” as they say. So we hammered ourselves into shape. We got by on sheer will power. There was no one to help, or so it seemed. It was up to us. Anything else looked and sounded like weakness. It never crossed our mind that there might be another way. We had no clue that one more powerful than us would really show up and redefine what power means. I wonder how many times we have said no to God simply because we had no idea. It was not a matter of disobedience, rejection, or unfaithfulness. We just had no idea that God’s ways are not our ways and God’s thoughts are not our thoughts. We thought we understood and had it figured out. We thought our ways and our thoughts were God’s and left no room for God to surprise us. Who can blame John? How could he or we expect the Creator to be baptized by the created, that the Creator would give his sandals to the one who is unworthy to carry them? And yet, that is exactly what Jesus does. “And do you come to me?” That’s not just John’s question. It’s also ours. At some point or another we’ve all asked it. Sometimes it just seems too incredible to believe that God would come to us. Maybe it’s because we see God as distant, cold, and uninvolved. Maybe it’s because we see ourselves as unworthy and undeserving. Maybe it’s because we were taught that God is more concerned about our behavior than our life. Maybe the pain, difficulty, and losses of our life have caused us to wonder whether God even cares. Maybe God’s ways don’t fit within our expectations. God won’t fit within our box and we can’t seem to get out of it. I don’t know when or how that question comes up for you but I know where we find the answer. The answer is found in the baptism of Jesus. His baptism answers once and for all the question, “And do you come to me?” “Yes, absolutely.” That is Jesus’ answer to John, to you, to me, to everyone. There is no one to whom Jesus does not come. That answer, however, is not without consequences. Jesus’ baptism sets before us a choice. We can either prevent or consent, closing or opening ourselves, to the baptism of Jesus. The issue is not Jesus’ coming to us. The issue is our preventing or consenting to his coming. Our work then is to always move from preventing to consenting. That is our repentance just as it was for John. According to Matthew, John “would have prevented him.” John would have stepped in front of Jesus, stopping and denying Jesus’ baptism. That’s a pretty scary thought. It’s pretty frightening that we have the freedom and ability to prevent Jesus’ baptism. To prevent Jesus’ baptism means that we withhold ourselves from the God who comes. It means we deny God’s desire and longing for humanity expressed in the life of Jesus. It means we deprive God of the unique and irreplaceable love that he seeks in each one of us. In the end it means we deprive God of the life God wants to live and the life he wants to give to us. Jesus’ baptism is more than his immersion in the water of the Jordan River. It is his immersion into all of creation, into the depths of humanity, and into your life and my life. 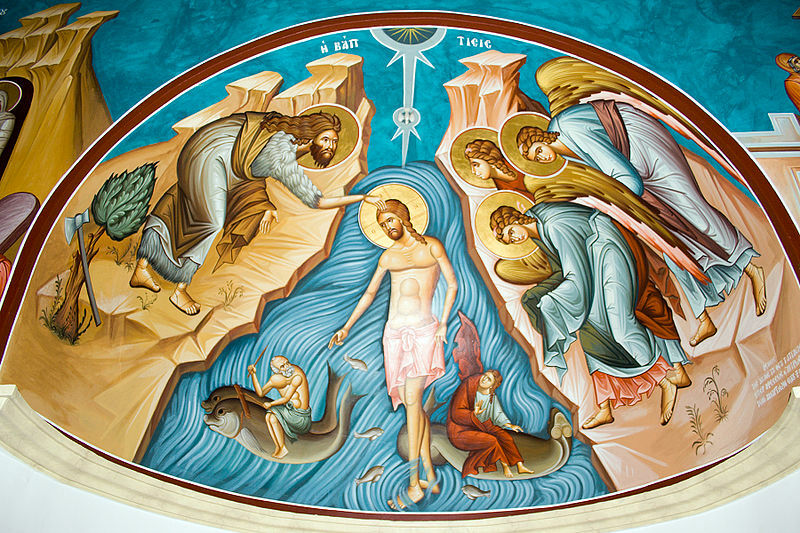 This is the baptism of Jesus to which John consented. John moved form preventing to consenting. That movement, that consent, is the fulfillment of all righteousness. It puts life and relationships back together again. It joins earth to heaven and humanity to divinity. That consent is how we offer the waters of our life to Jesus. Over and over again Jesus returns to the waters of his baptism immersing himself into the struggles and triumphs, the joys and the tragedies, and the deaths and resurrections of our world and our lives. He immerses himself in the wilderness of struggles, divided hearts, and temptations. He immerses himself in the compassion that recognizes the dignity of every human being. He immerses himself in the intimacy and love of a woman’s perfumed ointment, her touch, her hair, her tears. He immerses himself in the betrayal of Judas’ kiss. He immerses himself in the loneliness and rejection of Peter’s denial. He immerses himself in the pain of the soldiers’ blows, whips, and taunts. He immerses himself in the shame and humility of the cross. He immerses himself in the tomb and darkness of death. There is no part of your life or my life devoid of Jesus’ baptism. He immerses himself completely. He sanctifies our life’s waters. He assumes all that we are and takes on our life. He immerses himself into our life that we might be raised up into his. For every immersion there is a raising up. When Jesus came up from the water the heavens opened to him, the Spirit descended upon him, and a voice from heaven said, “This is my Son, the beloved, with whom I am well pleased.” With Christ’s immersion into our life the heavens are opened to us. With his immersion into our life the Spirit descends upon us as well. With his immersion into our life we are also God’s beloved children, sons and daughters, every one of us. “And do you come to me?” Yes, Jesus comes to us. He always has and always will. He can do nothing less. He is the God who comes. Consent to his coming. Offer the waters of your life. Let them be his baptismal water. Prevent nothing. Don’t withhold even one drop. Let every word, every action, every choice, every relationship be the place of his immersion and your raising up. It is the fulfillment of all righteousness. You wrote: “Who can blame John? How could he or we expect the Creator to be baptized by the created, that the Creator would give his sandals to the one who is unworthy to carry them? And yet, that is exactly what Jesus does.” Jesus is the nephew of John and not the Creator of the universe, but the son of God. Thanks for reading my blog and leaving a comment. I agree that Jesus is the Son of God. He is, however, the cousin not the nephew of John. When I speak of him as Creator I am referring to the Prologue of John: “In the beginning was the Word, and the Word was with God, and the Word was God. He was in the beginning with God. All things came into being through him, and without him not one thing came into being.” (John 1:1-3). I apologize if I was unclear about that. Sorry, yes, in English we had to say “cousin” (we may not forget that). John constructed his gospel as the Torah and considered Jesus as the beginning of the New World or the creator of the world where those could belong to in case they accept Jesus as their saviour. But the Word John is speaking about is the Speaking of God, The Voice of God, Jehovah His promise in the Garden of Eden, so at the beginning of times, when the first man had sinned. God His Speaking was part of Him and was with Him, like any speaking of us would also be with us, when it is not recorded on a tape, or disk. Would god have not told a lie when He said “This is my beloved son.”? And would Jesus in case he would be God not have lied on many,many, occasions? Thank you for your explanation. Though I disagree with your interpretation I appreciate your sincerity. God bless you for your great and profound sharing: really appreciate it. You dig deep into the the scripture in such a beautiful way that I can now understand the stories and the meaning! Best wishes. I often think about this question: what has me withhold myself from others, from the world (in this context, from God)? Especially when I’ve experienced what happens when I give myself. That’s an important question and observation. It reminds me of Jesus’ statement that those who lose their life – which I hear as giving their life away – will gain their life, and those who keep their life will lose it. Your comment makes me wonder what is the life that wants to be lived in me and what are the ways I prevent it. Lots to consider; thank you, Narelle.